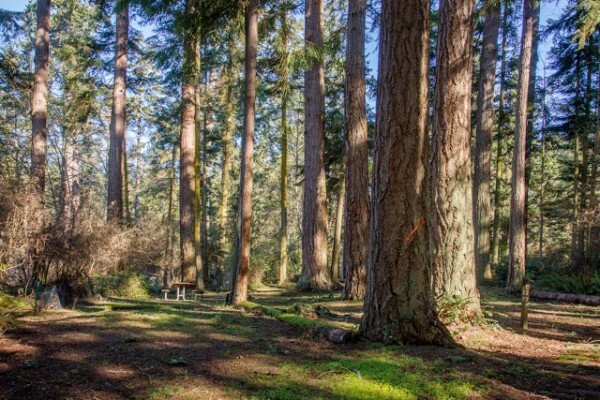 When the Washington Department of Natural Resources (DNR) created the precursor to South Whidbey State Park, it chose the most idyllic spot for camping, in the middle of the largest stand of old growth trees. 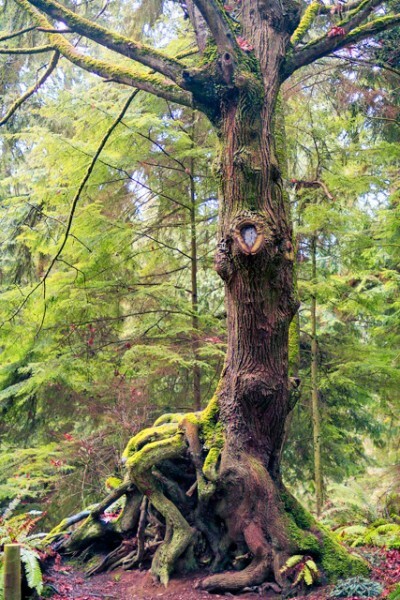 Now, it is one of the only stands of old growth trees left on Whidbey Island. The scattered giants are testaments of what once was: the great forests of the Pacific Northwest. But the now 20-acre campground, with more than 40 campsites, has become incompatible with the environment. Should the trees stay and camping go? Or should camping stay and the trees go? So the question is, who stays? Camping? Or the trees? A large, healthy looking Douglas fir in the campground sounded the alarm when it toppled over one still night in March 2015. 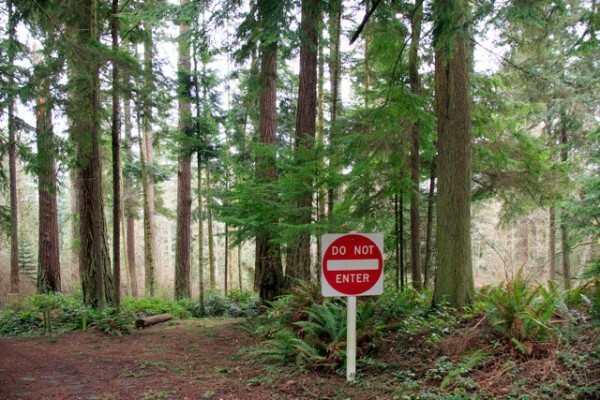 Park rangers became concerned that there might be other hard to detect hazard trees in the campground. Washington State Parks closed camping in 2015, pending an evaluation. The evaluation confirmed that many of the trees were indeed diseased. Thus began a four part, public “Classification and Management Planning” process to determine the future of the trees and camping at the park. 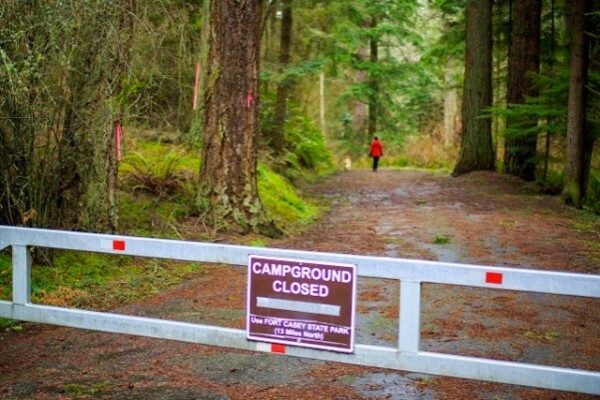 The South Whidbey State Park Campground was closed in 2015 due to concerns about tree health. 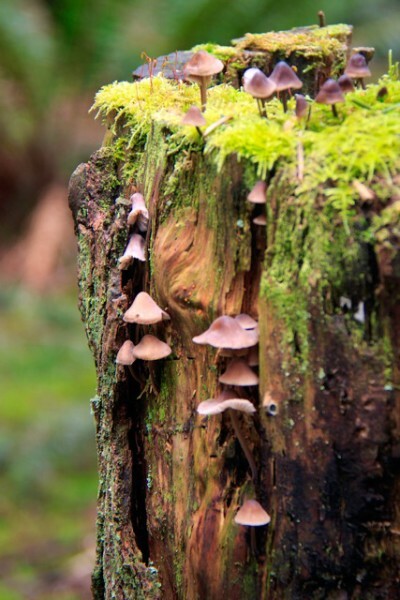 Some of the trees suffer from Schweinitzii Rot, also known as cow pie fungus, which rots the tree from inside the heartwood out, degrading the structural integrity of the tree. Others are suffering from Laminated Root Rot, which attacks the roots of the tree, impairing the ability of the tree to take in nutrients and causing instability. Schweinitzii and Laminated Root Rot can be hard to detect, and are virtually invisible to the untrained eye. While decay is a natural and important part of forest ecosystems, the campground likely sped the process. 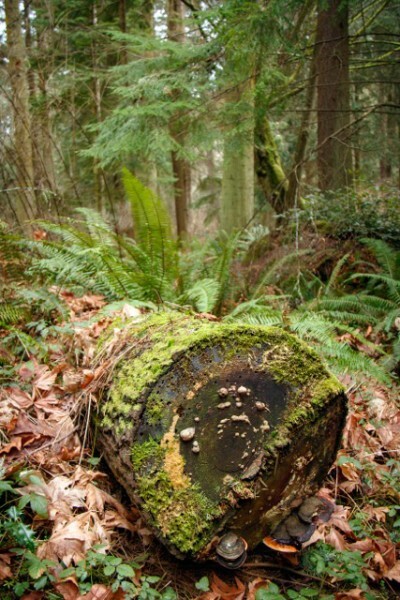 Decay is a natural and important part of old growth forests, providing habitat for many species, including endangered species like the Great Horned Owl and Marbled Murrelet. Human impact hastens the decline of trees. Vehicle and foot traffic compacts soil around root systems, stressing trees and leaving them vulnerable. Wounds caused during development open gateways for pathogens, as do the unknowing whacks of campers’ hatchets and axes, and nails driven into trees to support tents, tarps and clotheslines. Inevitably, we may be destroying that which draws us to wild places and campgrounds like the one at South Whidbey State Park. 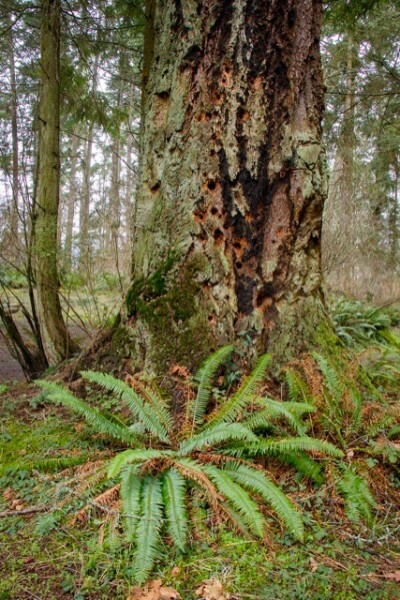 The Pacific Northwest old growth forest is the stuff of which magic is made, and old growth stands like the one at South Whidbey State Park is what is left of that magic. 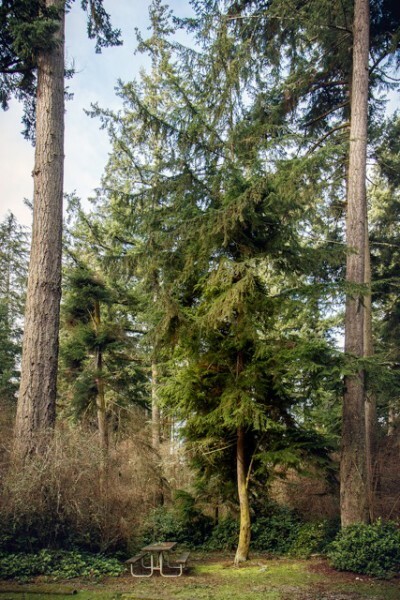 Stands of old growth trees, like the one at South Whidbey State Park, are all we have left of the icon of our region – the Pacific Northwest Old Growth Forest. Painted 100 shades of green. Garlanded by feathery wisps of blue green lichen on giant trees. Blanketed by the mossy down of the forest floor, where iridescent red, pink, yellow and orange fungi play peek-a-boo through the seasons. One needn’t reach too far in one’s imagination to see dancing sprites and forest fairies in the fairy tale world of an old growth landscape. 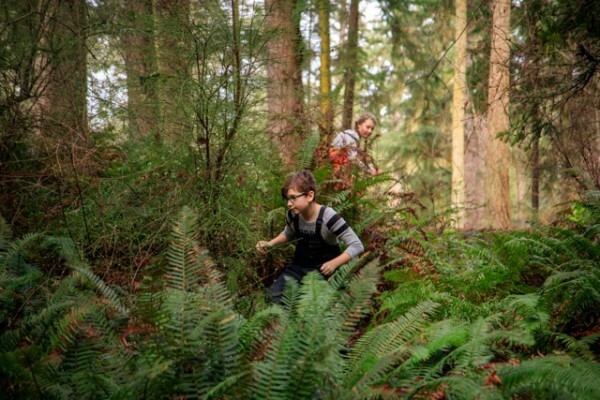 Like forest sprites, the students of the Calyx School are home in the forest of South Whidbey State Park. 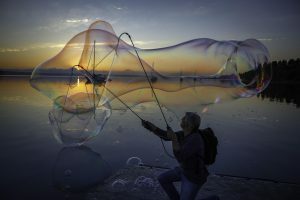 But magic is not the exclusive domain of the imagination. Old growth stands are full of biological magic. Take, for example, fungus. With a cellular structure more akin to an animal than a plant, fungi create an underground information superhighway to share and exchange information between plants. And lichen, a hybrid species of algae and fungi, hangs in the highest reaches of old growth trees and is as old or older than the trees themselves, but with deep sea algae ancestors. Over 100 million years old, horsetail is considered a living fossil. And the virtually indestructible Tardigrade, also known as the water bear or moss piglet, is a tiny eight-legged animal that dwells in moss and can survive extreme conditions such as cold, fire, pressure, or radiation that would kill most known life forms. Our old growth forests, and the few remaining old growth stands, are full of unfathomable biological miracles. They are full of magic. 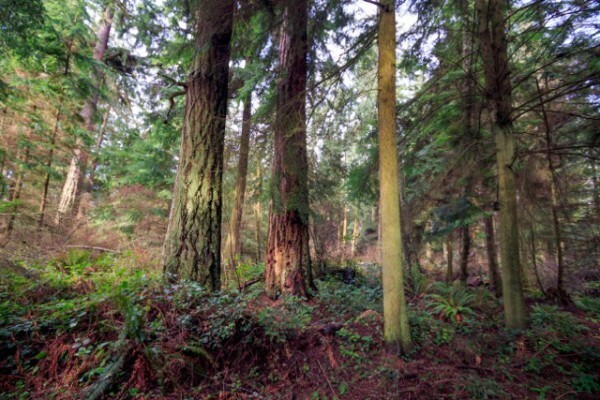 Pacific Northwest old growth forests range in age from 200 to 1000 years old. Home to thousands of species of trees, plants, fungi, arthropods, lichen, birds, mammals and microorganisms, some of these species exist nowhere else on earth. 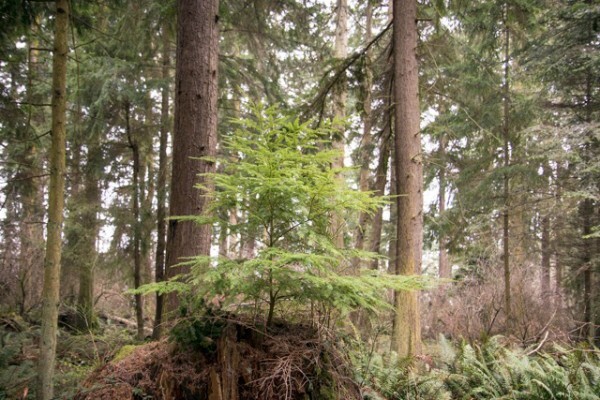 The Pacific Northwest old growth forest is an oxymoron. It is simultaneously dead and ever so alive, depending on rich decaying matter like nurse logs and standing snags to sustain the rich cycle and diversity of life. The diversity of tree species, and the size and age of trees of our old growth forests are unmatched by any other forests in the world. Some forests, such as California’s Redwood Forests, have larger trees of a single species, and some have older trees of a single species, such as the Bristlecone Pine; however, only the Pacific Northwest old growth forest has a variety of tree species – Douglas Fir, Western Hemlock and Sitka Spruce – that grow very large and very old. This diversity of very large, very old trees contributes to another unique feature of our old growth forests, which is the sheer amount of biomass, the weight and density of living organisms that call the forest their home. Found in parts of Northern California, Western Oregon and Western Washington, such density of life and diversity occurs nowhere else in the world. Diversity is the fountain of youth for the Pacific Northwest old growth forest, sustaining more life than any other forest in the world. While change is a natural part of old growth ecosystems, not all change is natural. One thing we may be collectively learning through mass extinctions and melting glaciers is that some change is irreversible. There are some things that just don’t come back. At least not in the foreseeable future, in the centuries to come. Old growth trees are part of this group. Calyx School, located in the park, is an academic program for ages 5 – 10 with lessons that include naturalist trail hikes, ecological surveying and stewardship of the park. Its mostly outdoor, nature and arts based curriculum is science rich and supports interdisciplinary learning. Today, the older Heartwood students of Calyx are outside preparing for a staged reading of “The Lorax” by Dr. Seuss. The sun is shining and the group is joyful, as they read their parts in turn, helping each other and giggling along the way. This will be the Calyx contribution to Whidbey Earth Day celebrations on April 23. They also hope to perform “The Lorax” in the amphitheater at the Park itself to inform the Park’s public decision-making process. Should the trees go and camping stay? Or should camping go and the trees stay? 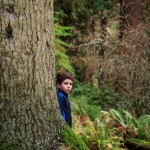 Editor’s Note: Please scroll down for more photos by David Welton of the South Whidbey State Park Forest. 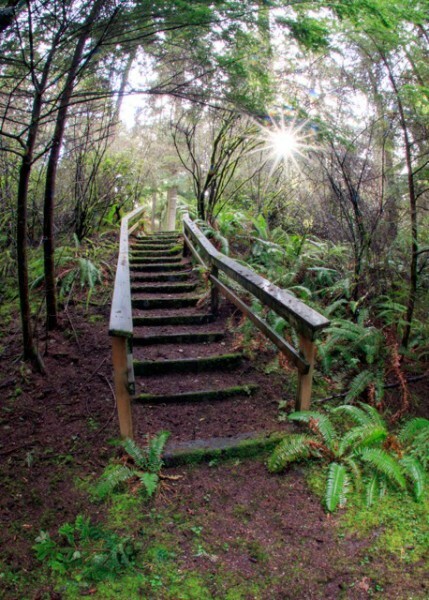 Lisa Kois has a long relationship with South Whidbey State Park. 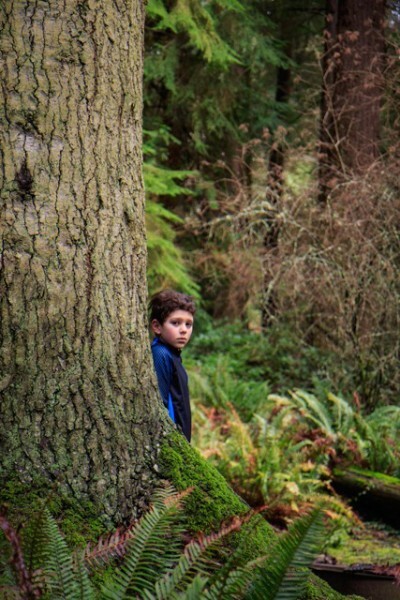 In 1977, her grandfather helped save the old growth trees of what was then the Classic U Forest, which became part of South Whidbey State Park in 1985 after a lengthy legal battle. Lisa now runs Calyx School, the 347-acre classroom at South Whidbey State Park, where she spends her days with the Calyx students, learning from and caring for the Park. This article and photos simply gives me goosebumps. I LOVE this place, and you have captured its magic and mystery in your words and images. Thank you! This is a lovely and compelling article, Lisa. Thank you for informing and moving me. I will be coming to “The Lorax” & visiting the park again soon for a gentle walk. We are from Cleveland, Ohio and walked this amazing park (including the quiet old campgrounds) on our last visit to Whidbey in September 2015. (We encountered a young class on the trail having their lunch. Maybe it was your class Lisa!)) It is a place we visit often in our memories; it’s magic is still with us! The park is at the top of our ‘to visit’ list during our next stay on the island. Thank you for the beautiful reminder! P.S. Thanks to your grandfather! Thank You Lisa! I hope the trees are still standing for all to enjoy when you return. The safety concerns of the State park folks is well placed. Even a smallish limb from those rotten old-growth will kill you. The park does have a wonderful waterfront camp spot there,however, so I think the best plan is to remove the old-growth and larger second growth as carefully as possible. The Park Dept. is broke anyway, and the revenue might help maintain and build some decent trails. (case in point is the trail in the Possession park, built by volunteers, and left untended, that goes up to the bluff.) Too bad you wont get much money for defective old-growth, and they are too big for most of the remaining mills to manufacture. Leave some culls on the ground for the kids to climb on. The real old-growth ecosystem is across the hwy, anyway, with the beautiful Sitka spruce and Dougfir / hemlock / cedar bordering some wetlands. How much old-growth does the tourist need? Get some professional Foresters and loggers to do the job, my experience with the operations of the Federal and State Parks proves that this kind of thing is beyond their competence level. I am probably the best man to plan and manage and market this thing, but you can’t afford me. Good luck! A wonderful article that captures the magic of SWSP but …. you didn’t mention the wonderful cedars. Great job, Lisa and David! I learned a lot about the state park, you and Calyx. I’m still hoping to visit you guys out there one day. Great photos David, especially ‘Should the trees stay and camping go? Or should camping stay and the trees go?’ and the ‘picnic table portrait’! Thank You Declan! Most of my photographs of South Whidbey State Park in the past have been of the Wilbert Trail and the big cedars across the highway from the campgrounds, as I did not want to disturb the campers. Now, with the campground closed until these issues are worked out, there are no campers. These photographs are from this February, a very wet month. I will return frequently throughout the coming year during all conditions to photograph the beautiful trees while they are still there. I hope upcoming opportunities for public comment will lead to preservation.